I would like to introduce Balck B3 Media the leading actor of this story. 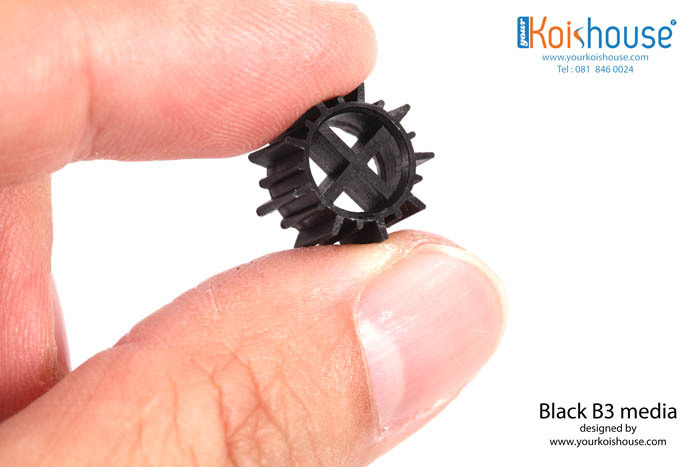 Black B3 Moving Bed will help usin the best way to entrap the food, eliminate waste, i.e. poisoning gas, the main factor of water pollution. 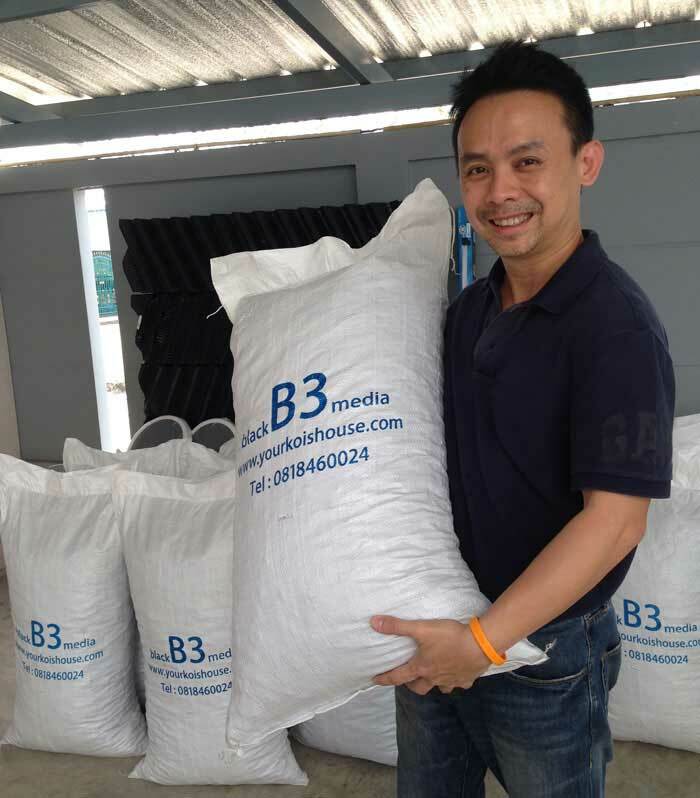 .Black B3 Media is designed for the best efficiency in turning the waste water into the clean water. 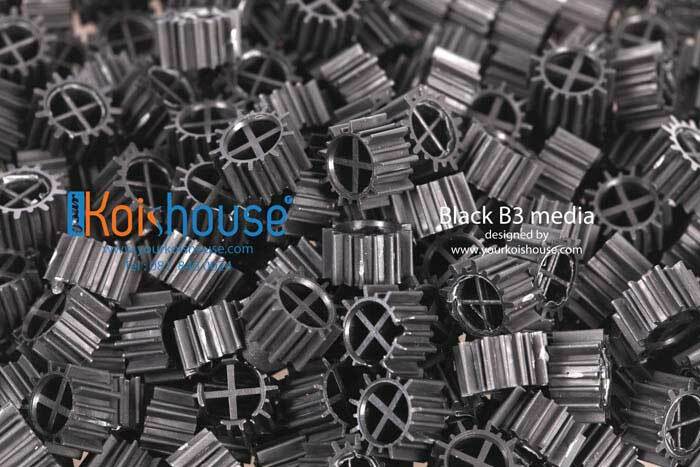 Black B3 Media can be used both with Moving Bed and Fix Bed systems on the surface area of 900 sq. m / cb./m. 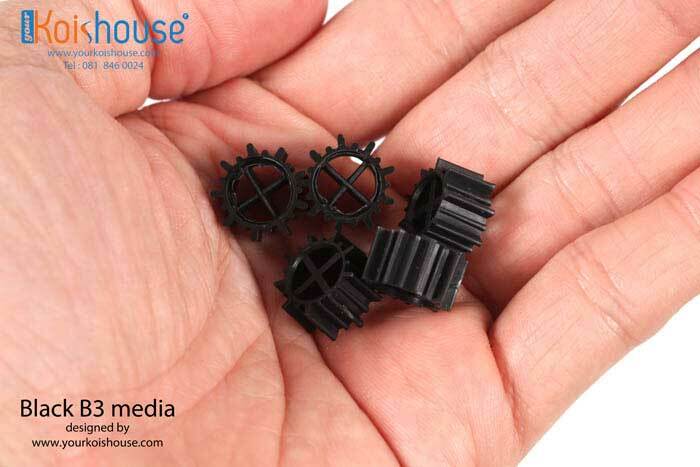 Look at these small sprockets with the clips. It seems that they are all the same. But no, they are not. If you look better you will see that they are different.Efficiency of work depends on the type of the clip. 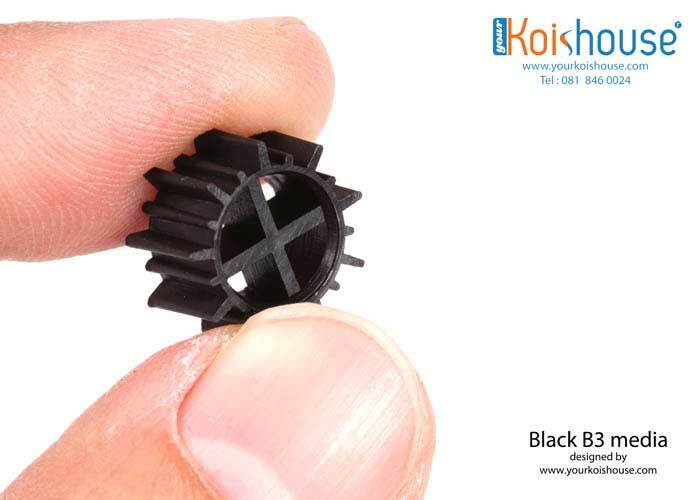 Black B3 which is the greatest value for money for everybody. .Nowadays more and more koi fish lovers farm the fish in a modern way, เbecause they use the principle of water treatment in filter pools with the use of engineering science for the environmentin order to improve the shape of the ponds to make it suitable for using filter pools and systems for air supply, which has changed a lot since the past time. This is why our fish is more lucky. It can be seen on contests of fish farmers. Now their fish looks bigger, healthier, more plump, its colour is more beautiful.Modern ponds have really clean water, that’s why the fish grows well, becomes more beautiful and lives longer. Water in the fish pond must be clear, clean and without waste that cannot be seen with a naked eye. This is very easy. You need not worry. You can do it yourself – I will explain everything and answer your questions so that you could easily understand. You needn’t read any manuals.I know that you are in a hurry and want to have a pond as soon as possible. ….Welcome everybody to koi fish farming! Water in fish ponds is usually full of waste that come from the fish excrements, mucilage and fish food scarps. Due to this the fish gets sick and weak. But don’t worry. The filters still work.…. The first filter’s job is to trap big dregs, so that the next filtercould be less loaded. So, if the first filter also has Cross flow media, the next filter will work even better. Because after trapping the dregs, there will be very little waste left.This filter works prominently on stopping big fish excrements, food scraps, middle-sized dregs, tree leaves debris that get behind. Next filter that goes after the first one is used for biodegradation of waste.This is the filter for Black B3 Moving Bed and it uses small living organisms called “bacteria” that have a great value for us and the important thing about them is that they can naturally reproduce themselves. There number of bacteria in our filter will depend on the overall condition of the pond – whether the bacteria have enough food, space and air. If yes, the water in our pond will be clean.Because small dregs will get stuck in Black B3and our leading actor will manage the poisoning waste waste – the water will gradually become cleaner. The whole amount of water will circulate 24 hours without stop.manage the poisoning waste – the water will gradually become cleaner. The whole amount of All we need is to add good air into the filter system, enough for bacterial growth.ด้วยนะครับ Let me repeat it once again: don’t forget to add much air and don’t forget to clean the filtering materials from time to time. It’s easy.If you clean the filter in due course it will not be clogged, bacteria will still have access to food and will not die. Their duty is to dissolve waste and dirt in a natural way to prevent clogging. I would like to underline that when we speak about the size of faying surface of the filter we do not mean the quantity of the filtering material. It’s a different issue. In case of some filtering materials if you want bigger faying surface you need to use huge amounts of the material which are not quite used in modern ponds, e.g. gravel, coral scrap, shells, volcanic ricks etc. The main problems with them are that they are very heavy and difficult to clean. The weight of those old-fashioned materials could be up to 500-800 kg for a medium-sized pond. For larger ponds one should have used a wagon of material! We need huge faying surface because bacteria need a place to live in and trap the food. The more dirt comes to them the better, but we must avoid clogging. 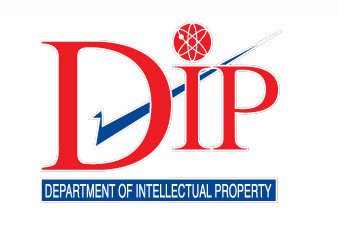 This is the modern material produced according to this principle. and it has apertures that let water flow freely without clogging, and water flows through both inner and outer surfaces,so that bacteria could easily trap food from water and have enough nutrition and air to be alive for a long time. 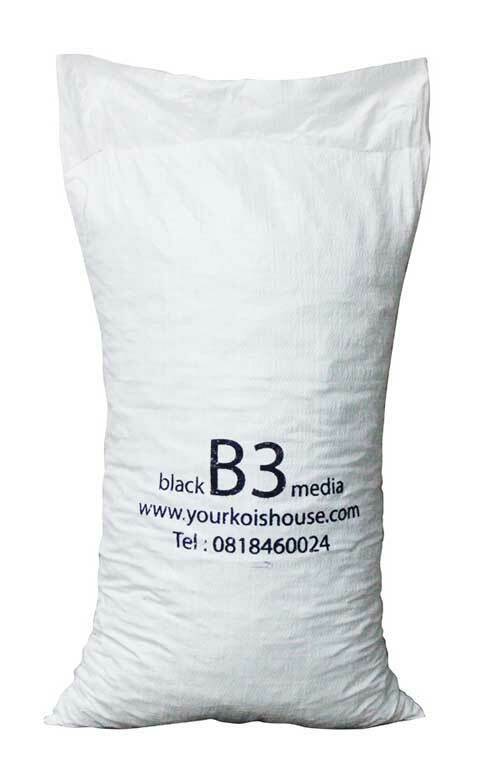 Black B3 media is very light. 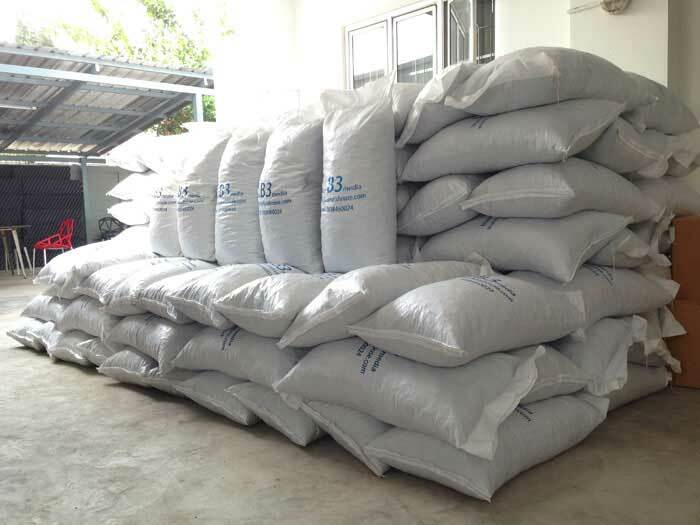 It is produced from PE pellets. Its specific gravity is 0.95. It can float in water, partially submerged, due to which it can be easily cleaned with compressed air. The cleaning will take not more than 15 minutes. fold, and in some cases even three-fold. Above all, Moving bed system can add efficiency immediately without changing the size of filter apertures. This method is very popular worldwide and it is also used in fish tanks. 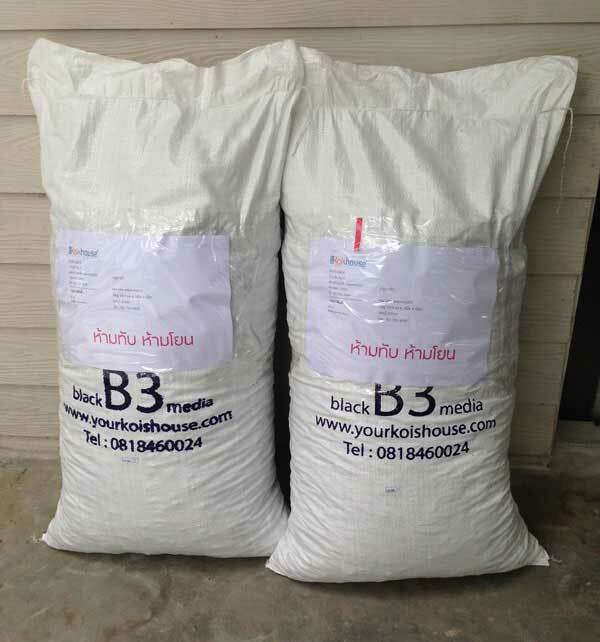 Black B3 media can be used as moving bed and fix bed, or, to put it simple, you can stir it in the filter with compressed air coming through an oxygen plate, or you can just leave it to float in the water in the filter without stirring in order to trap all small and big dregs. Using moving bed technology is is best in the filters where the water flows from top downward, and the amount of filtering material must be one half of the water load in the filter aperture. E.g. filter with dimensions width 0.5 × length 0.5 × depth 1.5 will have the water load of 0.38 ton or 380 liter. 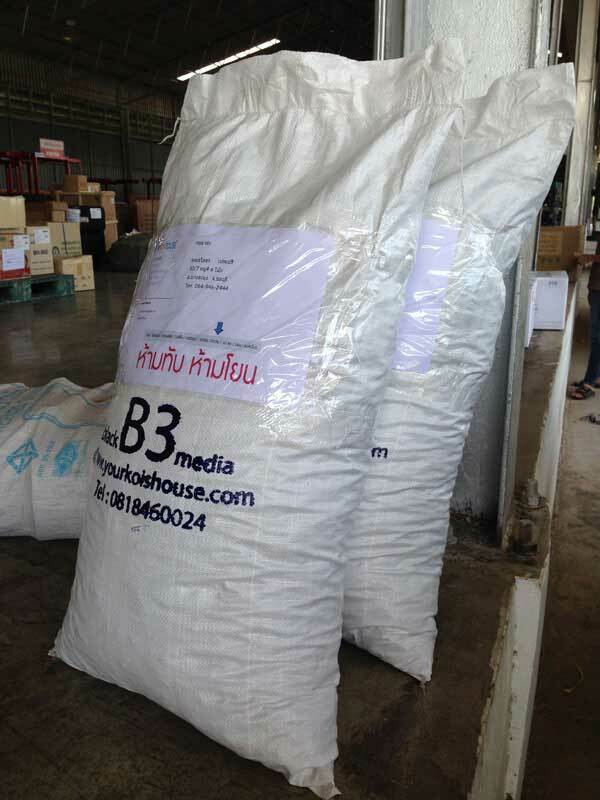 So, we must use 190 or 200 liters of Black B3 media. 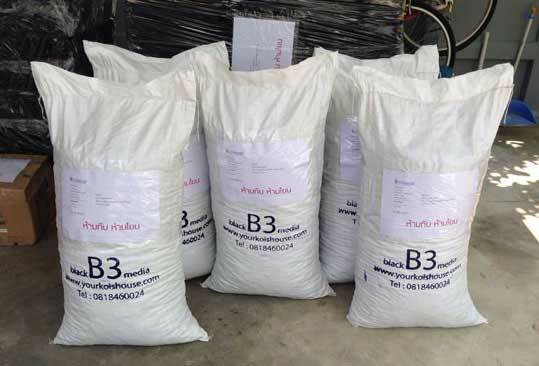 When we use fix bed technology which is is good for filters in which the water flows from bottom upwards and in which Black B3 media is not stirred, we calculate the amount in a different way. The height of Black B3 media in the filter at the time of water inflow must be about 50 cm. E.g. 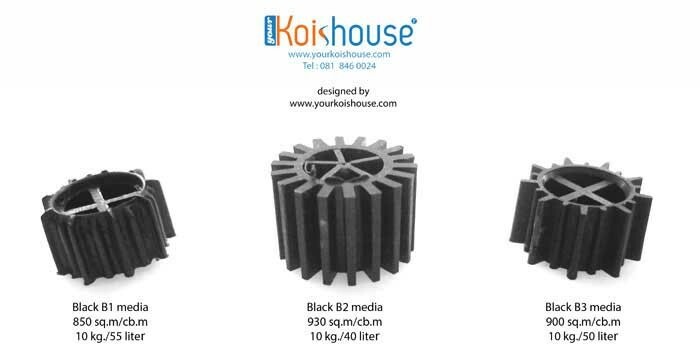 if the filter’s size is 0.5 × 0.5 × 1.5, we can calculate it as 0.5 × 0.5 × 0.5 = 0.13, or 130 liters, so we must use only 130 liters of Black B3 media. 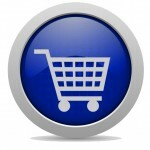 Or you can ask on the href=”https://www.yourkoishouse.com/forum/index.php?board=3.0″ target=”_blank”>web board. Good product, good price, easy to use, good to use, very clean water. You can use either moving bed or fix bed – you can trust both! Faying surface 900 square meters /cubic meter. Standard quality for export. พื้นที่ผิว 900 ตรม./ลบ.ม ปริมาตรบรรจุ 50 ลิตร/10 กก.